After Mike Anderson removed Anubis from power in Battleclash, an alien race identified as the Eltorians appears with a plan to enslave Earth. Armed with his Standing Tank, the ST Falcon, and you as his gunner, Mike sets out to battle his way through the evil ST pilots on his way to the Eltorian command. 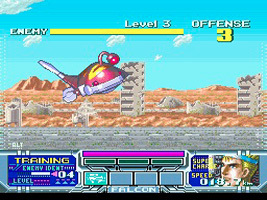 The ST Falcon moves automatically, chasing after the enemy STs. Using the Super Scope, shoot the weak points of the enermy STs while defending against their shots. Let the meter charge for a powerful shot, or hold it for a rapid shot. You can now stock charges to unleash an extremely powerful Treble Energy Bolt that may turn the tide of battle if used at the right time.